A couple of days ago, it was my birthday. I turned 25. So I think it’s an appropriate time for me to reflect and give my thoughts on what I thought were the three most significant events that have occurred during my lifetime. 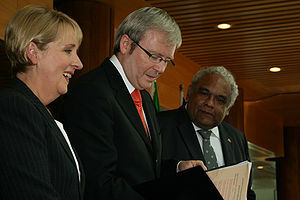 When Kevin Rudd became Prime Minister, one of the first things that he did was to formally apologise to the Aboriginal people who were taken away as part of the Stolen Generation. I place this as the most important thing that has occurred in my lifetime. The reason for this is that the institutionalised removal of Aboriginal children is a black mark on the history of our nation. When Prime Minister Kevin Rudd apologised to the Aboriginal people, we as a nation said to those people “We are sorry for what we did.” It didn’t solve the problem. There are still a large number of issues to deal with in our treatment of Aboriginal people (the Northern Territory Intervention, for example) but those two words, “I’m Sorry” started the journey. September 11, 2001. I was watching Rove Live (which in WA was in fact a delayed telecast). Then all of a sudden it switched to live news feeds from the US, when a plane ploughed into the twin towers. While terrorism existed before, this event thrust it into the public mind, and changed everything. We’ve got increased security at airports, a war that has been running for almost 10 years, and more. The election of President Barak Obama signified a change in the administration in the US, and the election of the nations first African-American president. Obama came in with a platform of change – the “Yes We Can” motto will be one of the most famous in political history. Yet, once in the presidency, he encountered significant challenges. Balancing the budget, attempting to get Health Care reform through, making the tough decision to leave Iraq. He has handled these situations well. No-one can say he has been the perfect president, but he has done very well. So that’s my three. What would your three significant events be? Next Next post: Climate Change… it doesn’t matter who caused it, we must act now.